What I should have been thinking about. What does the weather forecast say? Is the wind from the direction the forecast says? Which direction are the clouds moving? What is likely to happen to the weather? What time is low tide? What does that mean for the current on the course? What happened last time I sailed at this location? What do I need to do differently if the conditions are similar? What are the aspects of boat-handling on which I need to concentrate? Let's run through my starting routine a few times in my head. Think acceleration. What will I be looking for in the first beat? Remember to keep checking the wind over the course. Remember to plan a strategy for the run before the windward mark. Play the waves downwind. Remember what you learned in Cabarete. I will be the inside boat at the leeward mark even if I have to slow down to go fast. Think controlled aggression. I will hike hard on the beats. I will be smooth in the boat. I will execute perfect roll tacks. Think fast. Think positive. What I was actually thinking about. I wonder if that hub on the trailer is going to run out of grease. When was that telephone bill due -- should I have paid it this week? Wish I had bought a new sail. What time is that meeting tomorrow morning? I should have replaced that fraying line in the vang -- hope it doesn't break today. Geeze my eyesight is getting worse -- I should have bought some new glasses. What junction do I need to leave the highway? Looks like rain, did I pack my spray-top? Whoa -- where did that car come from? Is it going to blow hard today -- I haven't worked out for ages and may not be able to hike hard enough. The house-hunting isn't going very well -- are we ever going to find a house we want to buy? Damn -- I forget to rub down those rough spots on the daggerboard. When is the car next due for a service? Did I pack any sailing gloves? What's going wrong with the Yankees this year? Will I be able to catch the end of today's game on the radio driving home? Who will be at the regatta? This has the reputation of being a tough fleet -- I don't expect I will do very well. What on earth am I going to blog about tomorrow? Why run a big city marathon, like the Flora London Marathon for example? Well, one of the reasons must be for the sights. Running past historic buildings and world-renowned landmarks must be inspiring and give a boost to the runner's mental spirits and aching legs, wouldn't you think? Yes, it's true that the London Marathon route passes the Cutty Sark, Tower Bridge, Canary Wharf, Tower of London, London Eye, Houses of Parliament, Buckingham Palace and finishes in The Mall. It is never far from the River Thames and there are glimpses also of St. Paul's Cathedral, the Monument and the Millennium Dome. But it's also true that much of the route passes through some of the more drab parts of London, especially some relatively poor housing areas to the east of the city. And although the route is close to the river, you only cross the river once and for most of the route the river is not visible. I have to say that the first six miles or so were somewhat lacking in architectural merit. Time to try and settle in to a steady pace and not think too much about the heat. Probably just as well that there weren't too many visual distractions in Charlton and Woolwich. Then it was into Greenwich past the Royal Naval Hospital, the National Maritime Museum and try not to trip over the prime meridian. As a sailor it would have been a thrill to run past the Cutty Sark if it were not almost completely hidden from view by fences during its restoration. Ah well, I've seen it before so I can conjure up the memories. Then another long stretch through the Surrey docklands. But those tedious miles surely caused me to appreciate even more one of the highlights of the course, the crossing of Tower Bridge. Running through the first tower and on to the bridge which was crammed full of cheering crowds, seeing the River Thames and the Tower of London... Man, I was so moved I almost forgot to look out for the locations of the TV cameras and give them a wave. Hi Mum! But then it was back into more mundane territory heading east towards the Isle of Dogs and Canary Wharf. According to the official route description some of the highlights of this section include the entrance to a road tunnel, a traffic light tree, and the area where Henry VIII used to keep his hunting dogs. I could hardly contain my excitement as I trudged past these stupendous wonders of the world. Canary Wharf was kind of spectacular if you like skyscrapers. Europe's second tallest building (Wow!!) was mainly appreciated for providing some shade from the brutal rays of the sun. And then as I passed the new Billingsgate Fish Market (Double Wow!!) I had a strangely disorienting experience. I have written before about how I have an uncanny sense of direction. (Except when I am lost). So I was sure I was running on the north side of the River Thames, in a more-or-less northerly direction, a mile or so away from the river. When I suddenly saw in front of me the roof of what looked like the Millennium Dome. What!! That's on the south bank, downstream of here. It can't be the dome. Maybe it's something else that's a bit like the dome? Of course it was the dome. I was really running east and had forgotten that the river curves to the north on this stretch, so I was actually looking across to the south bank of the river. I was definitely starting to get confused here after three hours and over fifteen miles in the heat. And my pace slowed down too. Then it was back west along the city streets where the only vaguely inspiring sight was to see the marathon tailenders still heading east about seven miles behind us. Amazing -- there are folk running even more slowly than I am. And then into the best stretch of the route for sightseeing with most of the major sights of the route concentrated in the last four miles or so. Tower Bridge and the Tower of London; glimpses of St. Paul's and the Monument; the London Eye -- what brilliant audacity to build the world's biggest Ferris wheel across the river from the Houses of Parliament! And there they were, the home of British democracy and sauce bottle icon, the good old H-of-P tantalizingly close ahead of us on the Embankment. By now I was pretty much running on empty as I walked most of mile 25. But as I turned the corner and passed Big Ben it tolled the hour for me. That familiar resonant bong-bong-bong gave me a boost of energy as I found the will to run the final mile. Left into Birdcage Walk, the crowds cheering louder and louder, and then there it was -- Buckingham Palace. I was never so pleased to see Mrs Windsor's town home as I rounded the corner towards the finish line. Quick check to make sure that I'm not going to be photographed crossing the finish line with a fairy or a rhino, and then stagger across the line waving arms like a maniac for the cameras. Yeah, I guess the sights do make a big city marathon pretty special. But the best sight of all, waiting for me at the meeting point, was Tillerwoman. Thanks dear. I love the folk who comment on my confused posts on the theory of wind and sails, such as the one on Gradients, Tacking Angles and Coriolis, itself an attempt to clarify some questions raised in an email from a Dutch reader. It is pure joy to me to see how an apparently simple question can send my readers off in all directions with such a varied mix of answers. Carol Anne and Ant shared with us their experiences of wind variation sailing on inland lakes, while JB and Litoralis gave us a technical briefing on wind shear, gradients, viscosity and friction - not to mention fake forces. Fred gave us an insight on how wind varies with height on open water and even managed to explain how this whole issue is related to why there was so little sailing in Valencia last week. Tim and Milo focused in on one area that I had hoped somebody would pick up: why the apparent wind direction at the top of the mast will be different from that at the bottom. But wait. I see some disagreement here. Tim believes that "the wind will be more on the beam the higher up the sail you go" whereas Milo claims that "the apparent wind is more beamy at the bottom." Hmmm. They can't both be right, can they? What do you think? But none of these comments support the suggestion in the original email that the Coriolis effect (fake or otherwise) can cause an asymmetry between port and starboard tacks such as in the claim that "on starboard tack .... sailors experience more need for twist high in the main then on the port tack." It would seem to me that this would be true if there were some consistent change in true wind direction (as well as speed) between the top and bottom of the mast. Are we all sure that this is never seen? Are higher altitude winds generally shifted the same direction from low altitude winds? If so, does this effect apply at the scale of a boat's mast? One of my favorite sailing bloggers once accused me of being too enthusiastic in my praise of Laser sailing. So at the risk of upsetting S...s..l.r, I'm going to indulge in another "Up The Laser Rant". My April issue of Sailing World magazine finally caught up with me today. Many of the articles in the issue are a celebration of the Laser. So it seems I am not alone in my obsession. "The Laser is the only boat I've ever owned." "It's the pre-eminent raceboat of our time." "(I) couldn't imagine life without the Laser." "The Laser is the only boat I've always considered to 'be my other boat'." 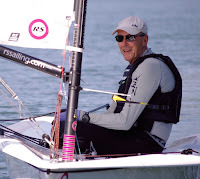 (After describing how how in 1970 he was asked by the Laser designer Bruce Kirby to try out his new design then known as the Weekender), "Today I enjoy day sailing my Laser as much as racing it. When I push away from the dock I still get the same thrill I experienced when Kirby let me take his Weekender for a spin." "Conviviality develops so that all participants have a good time and... they leave with a warm comfortable feeling of fatigue of the body and a quiet renewal of the soul." Tillerwoman and I have just returned to the US after a 10-day trip to the UK during which I ran in the London Marathon last Sunday. Depending on which account you believe this was the hottest London Marathon ever, or the hottest in eleven years. Either way it was bloody hot for running, by far the warmest marathon from start to finish that I have ever entered. According to the BBC, 5032 runners were treated by the ambulance service on the course and 73 were taken to hospital. Sadly, one of the runners taken to hospital died the next day. Apparently the cause of death according to some sources was hyponatraemia which can be caused by drinking too much water. World record holder Kenyan Paul Tergat described the weather as "harsh" and 600 people failed to finish the race including the pre-race favorite Haile Gebrselassie from Ethiopia. For me it was one of the most gruelling, inspiring, humbling, rewarding, memorable, painful, joyful, and sweaty experiences of my life. And it was bloody hot. 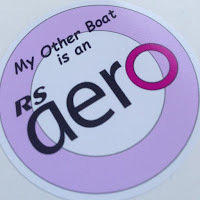 I can't possibly sum it all up in one post so will probably ramble on about in a few posts over the next few days, interspersed with random thoughts on sailing too. Four of my distinguished and erudite readers have already commented on the question raised by my Dutch correspondent about the Coriolis effect and its part in sailing tactics. They all were sceptical about the suggestions in the email I quoted. 1. Can wind direction at the top of a mast be different from the wind direction at water level? 2. If so, and you measure wind direction with a mast-head instrument and boat direction with a deck-level compass, then won't the angles between the close-hauled course and measured wind direction (tacking angle) be different on port and starboard tacks? 3. What causes the difference in wind direction between the top of the mast and water level? Isn't it the shifting of the high altitude wind by the Coriolis effect? Isn't it always to the right in the northern hemisphere? Just asking. I haven't a clue about this issue as it really doesn't come into play on a Laser. But if your mast is 292 ft high... what then? In the absence of any real sailing (by me) to write about recently, please indulge me by helping me to answer the question below that was emailed to me by one of my readers. It seems to me that this issue has all the potential to create as much confusion, misinformation and just plain bad science that I managed to stir up with my posts on How Sails Work early last year. The last 6 months I asked many off the same questions to myself that you also asked yourself. I have red everything that is to be red in regards to articles from A Gentry and I bought the latest version of C.A. Marchaj "Sail Performance". All in English so for a young Dutch guy a bit off an obstacle .... but I'm getting there. I'm not addressing you in regards to "how or why sails work" but about the "Coriolis effect" and it’s part in Sailing tactics. Nexus made instruments that can make the effect off wind gradient and wind shifts visible for us sailors. Very handy in regatta sailing. They claim that flowing air is influenced by the Coriolis effect. With an overall tacking angle off lets say 75 degrees to apparent wind it can happen that on starboard tack the tacking angle is consistent 35 degrees and the port tack 40 degrees. Also on starboard tack (beam to port) sailors experience more need for twist high in the main then on the port tack. I explain “beam to port” because here in the Netherlands we call a starboard tack a tack were the beam is on the starboard side and the wind is coming from port, I think in some other places they use it the other way around. Could you give me your perspective on this question …… Why is the Coriolis effect influencing the wind gradient/direction? I went Lasering on Saturday. It was all good. 1. First day of spring. OK, it probably wasn't the first day of spring on the calendar and the temperature was still in the 30s. But after over two months with no sailing it sure felt like spring to me. Since my adventures in Cabarete I've been too absorbed in all the hassles involve in selling and moving out of a house, not to mention training for the marathon, to fit in any time for sailing. Oh, and for most of that period the water on the lake in New Jersey was frozen too. That's way too long to go without a sailing fix. Call it Seasonal Affective Disorder or call it Sailing Withdrawal Symptoms. Whatever it was it wasn't pleasant and I'm glad it's over. 2. Sailing with my son. When we lived in New Jersey I didn't get to sail with my son, who lives in Massachusetts, very often. I think the last time was when I trounced him the day we raced at Lake Whippersnapper. Now that we've moved to live closer to our granddaughter (who conveniently happens to live in the same house as my son, her father) I'm looking forward to sailing with him more often. He's a big guy now but to me he will always be the little chap who used to sit backwards in front of the mast of my Laser and hang on to the mast for dear life about 25 years ago. 3. Not sailing on Tacticat. My son was (at least he was until Saturday) the UK National Champion on Tacticat. He spends way too much time huddled over his laptop playing that addictive game. So when I suggested that we go sailing on Saturday I half expected him to tell me that he wouldn't come because he wanted to defend his title in the Tacticat UK National Championship which was also being sailed on Saturday. I was very proud that he chose real sailing instead. He has his priorities straight. But in one of our breaks he did take the time to explain to me, with much handwaving to demonstrate sailing angles, how Tacticat had helped him understand the impact of shifts more clearly. Thanks for the lesson son. 5. Being invited to race. After racing we met a couple of guys from the sailing club on the lake. (We are not members at this lake.) They invited us to come and race with them when their season starts in a few weeks and we promised to make it when we can. 6. Learning something new. I'm always amazed that I learn something new almost every time I go sailing. Usually it's only some very minor point of technique. This time it was just something I noticed. Perhaps I knew it before and had forgotten it... When I was roll-tacking as I moved under the boom I was doing a very exaggerated "stand up" motion before rolling the boat flat. I noticed that at the high point of that "stand" I had such a better view of the wind on the water upwind and could see clearly all the little shifts and puffs. It sounds obvious but I don't think I had ever consciously chosen before to use the middle of a tack to check out the wind. I will in future. Every little piece of knowledge about the wind helps. And I need all the help I can get. I read somewhere that niche bloggers like me should remember that many people coming to the blog are new to the topic, sailing in this case. So as well as writing articles for experts such as Ethics and Rule 42 or Whether to Pinch, we should write posts aimed at total beginners to the sport. I'd love to do that and, having worked as an instructor recently, I do know some of the things that beginners need to learn. But it's so long since I started sailing myself that I can't remember what questions I had way back when. So give me some suggestion please. What "how to" articles would newcomers to the sport want to read on a sailing blog? When you relocate from one country to another you expect to experience all kinds of jarring culture changes. But when you move just over 200 miles in the same country? Surely not. I like to follow baseball. We used to live near New York City so it was kind of natural to follow the fortunes of the New York Yankees and to go and watch the occasional game at Yankee Stadium. Yankee fans can be passionate about their team. They expect them to make the playoffs every year and they usually do. They expect them to win the Worlds Series, and they've done that more than any other team too. I now live near Boston. Boston Red Sox fans are different, very different. They are not just passionate about their own team; most of them hate the Yankees too. Kind of illogical as, in these days of free agency, top players can and do move from one team to another. So this year's hero of the Red Sox can be playing for the Yankees next year. But historically the Yankees have usually been the obstacle preventing the Red Sox from progressing to high honors. So Red Sox fans have this huge inferiority complex about the Yankees. I knew all this, but this week I saw the most amazing display of the twisted culture of Red Sox Nation that I truly believe I may have moved to a different country. I took my 16-month-old story granddaughter to story time at the local library. There were three other cute little girls there too. Not as cute as my granddaughter of course. She's in a class all of her own. She even has my hair. Now one of these sweet little girls, no more than 18 months old was wearing a pink T-shirt with a slogan on the front saying "YANKEES STINK". Can you believe it? What kind of twisted mind has such a venomous hatred for another sports team that she labels her baby daughter with a slogan expressing her own loathing? Doesn't that go beyond sports mania into the realms of obsession, paranoia or other mental illness? We're not in New Jersey any more, Toto. Seems like I'm not the only sailor planning to run the London Marathon. First solo female to navigate the globe non-stop west-about Dee Caffari will be running too. In the latest update to her Marathon Training Diary on the Yachts and Yachting site she writes about her plan to do her 18-20 mile long run over the Easter break. I'm psyched about the marathon now. All the paperwork including my official race number arrived this week. And after failing to complete the 25-26 mile run a few weeks ago, I managed to complete the longest run of my training last Friday with a 29 mile run on the East Bay Bike Path in Rhode Island. What a superb route for running (or biking if you must). The path winds from Providence to Bristol for 14.5 miles with good views at points of the Providence River, Narragansett Bay and Bristol Harbor. Not many sailing boats out yet but I did spot one yacht sailing on the far side of the bay and a couple moored near waterside homes in Barrington. It started as a still sunny day with some wisps of wind on the other side of the river. The breeze reached the bike path around 2pm and some welcome clouds kept the temperature down to more reasonable levels than on my previous long run. I maintained a relaxed slow pace, kept well hydrated, and took breaks for snacks, drinks and other needs of nature. The next day I felt surprisingly fresh but my legs knew I had done a long run when I went out to run again the day after that. It's all downhill (metaphorically speaking) from here. No more long runs as I taper the training in preparation for the big day 17 days from now. I'm feeling good. But I have to admit I don't look as good as Dee! Goose Poop Beach Sailing Club? No, of course that's not the real name of the sailing club I'm going to describe. In line with my policy of preserving anonymity for the victims of my blog I decided not to use its real name. But those of who have sailed there will recognize it... and know why I chose that name too. GPBSC was the first sailing club that I joined when I moved to New Jersey from England. There's probably going to be a few nostalgic posts in the next few weeks about sailing in New Jersey now that I have left the place. Perhaps we only appreciate what we have after we have left it? GPBSC is the ultimate off-the-beach dinghy club. Club house? Doesn't have one. Safety boats? Hell no. Race committee? Not really. Friendly, competitive, top-class one-design sailing? You bet. The club sails every Sunday morning off a beach on the lake near where I used to live. It was the ultimate luxury. Roll out of bed on Sunday morning. Wheel a boat on a dolly about 100 yards from my house to the launching ramp. Go sailing. Repeat week after week, year after year. When I first moved to the town the club had an Open fleet as well as a Sunfish fleet. My sons (then aged 8 and 10) and I had brought two Optimists and a Laser with us from England. We raced in the open fleet with Portsmouth Yardstick handicaps. There was a 470, some Laser 2's and various other dinghies. It was laid-back, casual, family-oriented racing. But after a few years for some reason the fleet dwindled and died and we moved over to Sunfish. Aaaah the Sunfish. I couldn't believe this crazy little boat the first time my neighbor lent me his. It couldn't point. It seemed under-powered. But in the next few years the class introduced a better sail and daggerboard and it wasn't quite such an awful boat. But who cares about boat performance? That whole area of North Jersey is full of little lakes with Sunfish fleets. When in Rome... as they say. I'm a strong believer in one-design sailing and going with the flow, racing whatever the locals race. So the Tillerman family eventually bought three Sunfish and raced every Sunday at GPBSC and on the local Sunfish circuit. GPBSC has three fixed racing marks in the corners of a small lake. They are cleverly positioned far enough into the corners so that there is never any wind near the marks. This is so that when the leaders arrive at each mark they are becalmed and the tail-enders can catch up. This makes for closer racing. The starting line is another couple of buoys near the beach on the lake. All the sailors congregate on that beach around 10am. The fleet captain announces the course. Some combination of those three fixed marks. He makes a great show of sniffing the wind and trying to chose a course that will start and end with a beat. But we all know that the effort is futile. The lake is small and sheltered by many trees and a couple of hills, so whatever the wind is doing now it will be different by the time we start. But we didn't really care. After racing we used to run classes for anyone interested in learning to sail, adult or child. It was as much a public service as a recruiting tool. There were separate races for kids too. Some weeks there would be a barbecue and picnic on the beach too. It was a good time. The kids honed their racing skills in that Sunfish fleet. We made many good friends. And in spite of, or perhaps because of, the crazy random winds on that little lake it bred some excellent sailors. "Are you sad to be leaving?" That's what everyone asked us when they heard that we had sold our rambling old house in New Jersey and were preparing to move out. They expected us to be sentimental about the house, full of memories of raising a family and many other happy times. They thought that we would be heavy-hearted to move out of a dwelling that our realtor described as "stately" and even "majestic" in typical real estate hyperbole. But the truth is that we are not sad. It is time to move on. We did live almost twenty years in that one house. Longer than I have ever lived in one house in my life. And they were good years. But we are ready for change and looking forward to a new life in a new place. I will miss some things from my time in New Jersey. Being able to see the lake where I sailed from my bathroom window while shaving every morning. Running trails around the lakes in town. The three sailing clubs to which I belonged or where I worked as an instructor. The annual circuit of Sunfish and Laser regattas at familiar locations around the state. And most of all, the other sailors I knew from sailing in that area, many of them good friends. But I sincerely hope to see some of them at regattas over the coming years. And who knows, if we buy a house within striking distance of Newport or Hyannis or Buzzards Bay we will be able to be able to host our New Jersey sailing friends when they compete here in New England. No, we are not sad. This used to be a blog about sailing. It was easy to write because I thought about sailing (almost) every day. (Damn Tim Coleman for thinking of the best title for such a blog before I did.) Or if I didn't have an original thought about sailing, or had some sailing experience to recount, I usually spotted some weird item of interest on the web about some watery pursuit. So the blog almost wrote itself. The last couple of weeks I have completed the first part of moving house. We sold our big old family house in New Jersey, put most of our worldly goods in storage, and moved to temporary accommodation in southern New England to search for a new house in this area. Truth is the move has been in the works for several months now. I did consider writing here about all the trials and tribulations of selling and buying houses and moving... but that would have made it a very different blog. But the process of moving has occupied much of my mental focus for the past few weeks... not to mention it has been quite physically tiring too. And though I would never have expected it, the focus on moving house has not only meant I haven't had time to go sailing since my trip to the Dominican Republic in January, it has also meant I haven't even been daydreaming about sailing. And so the blog writing has dried up. Will the random thoughts on sailing start again and give me something to write about here? I certainly hope so. However it is amazing how being homeless concentrates the mind on searching for a new home. Perhaps I will write about that. Because as well as all of the usual criteria anyone would use to select an area to live and a house to buy, I have the sailing checklist too. What kind of sailing do they do in this town? How far is it from the nearest active Laser fleet? Where would I keep my boat? Where is the nearest boat ramp? Can I see water? Do the neighbors have boats? So we will see what happens. This blog is not closed.